CHICAGO, March 29.- At 11:30 o'clock tonight the condition of the Siamese twins was declared to be critical. They many not live until morning. It is considered improbable there will be an operation. Rosa became unconscious today. It was said at the home of Dr. Breakstone, director of the hospital, shortly before midnight that he feared the surgical shock to Rosa if the stricture uniting her to Josefa were cut. "The doctor believes the operation could be performed," it was said; but he does not think that Rosa in her present condition would not survive the surgery. The Celebrated "Siamese Twins" - Rosa and Josefa Blazek, are facing a crisis in a Chicago hospital. 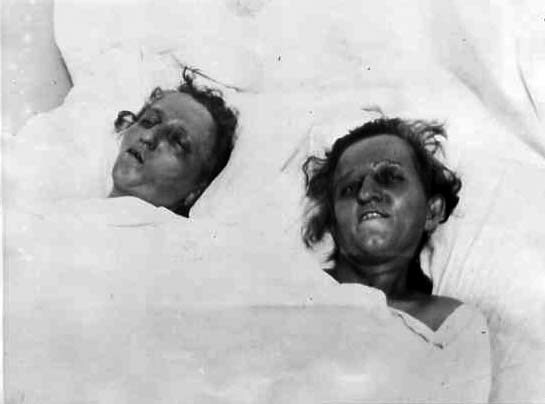 One is seriously ill with jaundice and should she die, it is probable that the other would also die, owing to the vital physical connection between the sisters, who are joined together at the hips. Rosa is the mother of a twelve year old boy, her husband was killed while serving with the Austrian Army during the war. Chicago, April 19, - Rosa and Josefa Blazek, the Siamese twins, left an estate of $400 cash, according to petition for letters of guardianship filed in the Probate Court here today. At the time of their it was said that the twins possessed a large fortune, both in America and Bohemia, their home.